Chaotic evacuations with emergency sirens blaring as the Missouri River rises to the top of the three-story-high levee wall in St. Joseph, Missouri! Record floodwaters that submerged vast stretches of Nebraska and Iowa farmland along America’s longest river reached a new crest on Friday at the waterfront city of St. Joseph, Missouri, forcing chaotic evacuations of thousands from low-lying areas. With emergency sirens blaring as the Missouri River rose to the top of the three-story-high levee wall in St. Joseph, about 55 miles (88 km) north of Kansas City, Missouri, sheriff’s deputies rushed door-to-door urging residents to flee to higher ground. 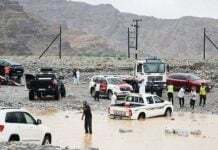 Many residents appeared stunned as they scurried out of their homes with armloads of hurriedly gathered belongings to throw into their vehicles before joining a steady stream of cars, pickup trucks, SUVs and tractor-trailers. The abrupt evacuation, coming as the river rose about 9 feet above flood stage, appeared to take authorities and residents by surprise. “We don’t have anywhere to go. This is overwhelming,” said Linda Roberts, 70, as she and her husband, John, 66, packed their SUV, their dog sitting uneasily in a pet carrier. With police doing their best to direct gridlocked traffic and with helicopters whirring overhead, dust billowed up from packed roadways for hours, mixed with the odors of livestock and chemicals, as the mass exodus proceeded in slow motion. The St. Jo Frontier Casino, about 5 miles to the north, was already surrounded by water, and roadways along the river were submerged, officials said. The flood crest was expected to reach the Kansas towns of Atchison and Leavenworth, about 35 miles farther downstream, on Saturday, and Kansas City as early as Sunday, officials said. 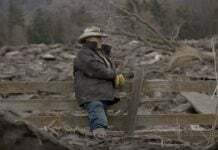 Missouri River flooding was triggered by last week’s “bomb cyclone” storm, which has killed at least four people in Nebraska and Iowa, left a man missing below Nebraska’s collapsed Spencer Dam, and inflicted an estimated $1.5 billion in damages in Nebraska. Torrential showers over hundreds of square miles of melting snowpack produced record volumes of runoff that poured into the Missouri just above the Gavins Point Dam where the river divides Nebraska from South Dakota, nearly 400 miles upstream from Kansas City. The dam is operated by the U.S. Army Corps of Engineers. Water entering the reservoir from that storm marked the most ever measured there since recordkeeping began 120 years ago, said John Remus, chief water manager for the Army Corps’ Missouri River basin. The downstream flow also broke flood stage records at three locations along the river. Nebraska farmers were digging out of flooded fields and coping with cut-off highways on Friday. “The biggest thing right now is the transportation. We’re right between Loup and Cedar River, and transportation is nearly impossible,” said Ryan Sonderup, 36, of Fullerton, Nebraska, who has been farming for 18 years. Officials in Atchison, Kansas, were watching flood monitors carefully on Friday. “For the most part, the city of Atchison is much more fortunate than some of the other communities along the Missouri River,” the city’s assistant manager, Justin Pregont, told Reuters. Still, floodwaters were threatening a handful of properties and roads along the riverfront in the community of 10,000, he said. Missouri Governor Mike Parson declared an emergency on Wednesday as high water forced evacuations of several small farm communities in the northwestern corner of his state. President Donald Trump on Thursday approved a disaster declaration for Nebraska, making federal funding available in nine counties that had born the brunt of last week’s floods. 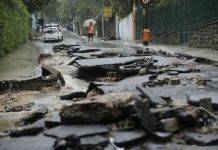 The threat of extensive flooding lingers over the wider region and could grow dire in coming weeks with additional rainfall and melting snow runoff, the National Oceanic and Atmospheric Administration (NOAA) said on Thursday. NOAA spokeswoman Lauren Gaches said during a conference call Thursday that existing flooding along the Mississippi River and other waterways is expected to get worse, possibly even worse than historic floods in 1993 and 2011. 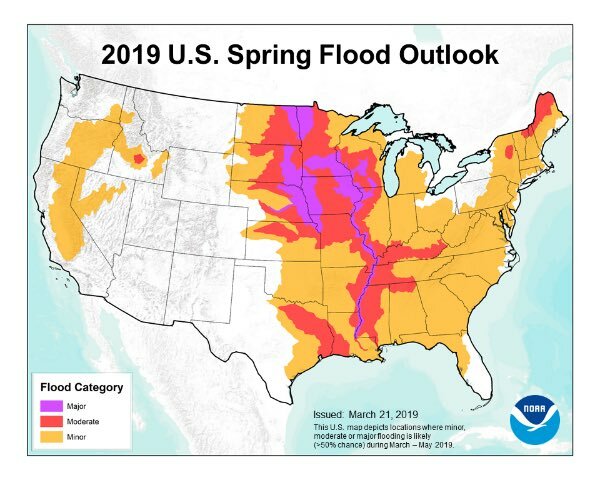 “This is shaping up to be a potentially unprecedented flood season, with more than 200 million people at risk,” Ed Clark, director of NOAA’s National Water Center in Tuscaloosa, Alabama, said in the agency’s spring outlook. Get prepared and be ready for the upcoming flooding!?! Home › Forums › Chaotic evacuations with emergency sirens blaring as the Missouri River rises to the top of the three-story-high levee wall in St. Joseph, Missouri! This topic contains 2 replies, has 3 voices, and was last updated by Devils Tower 4 weeks, 1 day ago. I mean man………..people saying they hardly had any notice………I guess they did not hear what was happening north of them?????? I live in Pa and I heard what was happening up north. Here is where the saying, “A wise man can see trouble coming and prepares for it” holds true. Reply To: Chaotic evacuations with emergency sirens blaring as the Missouri River rises to the top of the three-story-high levee wall in St. Joseph, Missouri!